ORLANDO, Fla., April 3, 2019 — Science-fiction writers have long envisioned human¬-machine hybrids that wield extraordinary powers. However, “super plants” with integrated nanomaterials may be much closer to reality than cyborgs. Today, scientists report the development of plants that can make nanomaterials called metal-organic frameworks (MOFs) and the application of MOFs as coatings on plants. The augmented plants could potentially perform useful new functions, such as sensing chemicals or harvesting light more efficiently. MOFs — which consist of metal ions or clusters linked to organic molecules — form highly porous crystals that can sop up, store and release other molecules, much like a sponge. Chemists have made thousands of different MOFs so far, with potential applications ranging from storing hydrogen fuel to absorbing greenhouse gases to delivering medications within the body. Having plants make small amounts of these useful compounds in their own tissues could give them new abilities not seen in nature. A press conference on this topic will be held Wednesday, April 3, at 9:30 a.m. Eastern time in the Orange County Convention Center. Reporters may check-in at the press center, Room W231B, or watch live on YouTube http://bit.ly/ACSLive_Orlando2019 (“ACSLive_Orlando2019” is case sensitive). To ask questions online, sign in with a Google account. Plants have a complex passive fluid transport system capable of internalizing small molecules from the environment, and this system offers an ideal route for augmenting plants with functional nanomaterials. A so far unexplored concept is the formation of functional materials, in situ, from precursors small enough to be passively internalized through the roots without harming the plants. Metal-organic frameworks are ideal for in situ biomineralization as they are composed of metal ions coordinated with organic ligands, and the precursors are small enough to be transported into and through plants. Moreover, MOFs have recently been shown to grow at bio-interfaces. Herein, we report the biomineralization of two types of metal-organic frameworks, Zn(MeIm)2 and Ln2(BDC)3, inside a variety of plants using mild reaction conditions. Zn(MeIm)2 was synthesized in a single step for plant clippings, while lanthanide MOFs (Eu2(BDC)3 and Tb2(BDC)3) were synthesized in a two-step process for both plant clippings and fully intact plants. Small-angle X-ray scattering and in situ synchrotron experiments helped elucidate the formation kinetics and crystal phases of the nano-biohybrid plants. 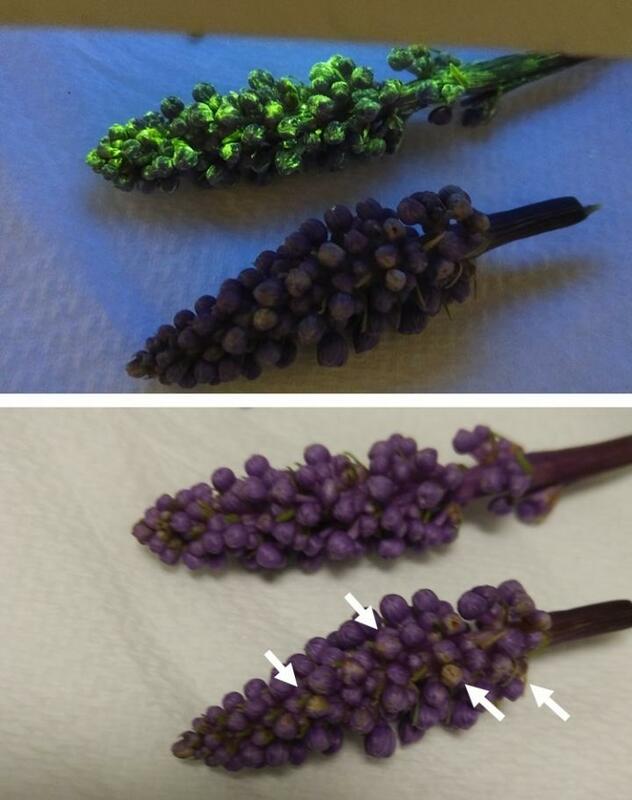 Plants augmented with luminescent metal-organic frameworks were utilized for small molecule sensing, although other applications, such as sensing and photocatalysis, are foreseeable. Overall, the in situ generation of functional materials inside of fully intact plants could lead to more complex nano-biohybrid sensors and organisms augmented with superior performance characteristics.